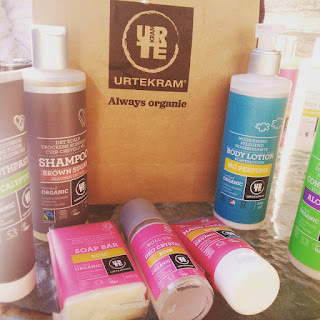 Urtekram are a Danish company that specialise in organic beauty products and they have been kind enough to offer one of you lucky readers a beauty bundle! To enter simply complete the form below, good luck! Use a good primer and remove make up before bed! Moisturise your skin whilst it is still damp from bathing, it works wonders! Less is more! I cringe when I look back at my teens photos! When I was younger I sometimes went to bed with my makeup still on after a night out, now I cringe just thinking about this. Taking off all make up thoroughly I an absolute must, also drink lots of water. put sun cream on everyday, a friend of the family has and their skin is amazing. Use a damp cotton bud on eyeliner pencil to smudge it out and correct any mistakes. Always always always take your makeup off before bed, even if you're so tired you have to do it with your eyes closed haha! To start using night & day cream in your early 20's. Moisturise your neck so it doesn't look like elephant skin in your 40s! My neck still looks pretty good! A woman is most beautiful when she smiles. Other than that, the most valuable tip I've learned is always use a skin moisturizer! Great giveaway, cant remember what the question was, kids driving me mad!! ALWAYS take your make up off before bed! lots of water and a good nights sleep. Cleanse well every night and remove all make-up. Never go to sleep without completely removing make-up. Don't feel you've got to slavishly follow fashion, season after season. If it doesn't suit you, just ignore it! That skincare doesn't stop at the chin! I take all my products down to my chest. Don't overcomplicate your skincare routine with too many products, keep it simple. To always put vaseline on eyebrows before plucking, dont know if this is still a good tip as I was told this in late 80's early 90's !! Drink water, take your make up off before bed! I really don't remember any. My mum only wears a very little, and I rarely bother at all. My daughter however is a goth, and loves makeup. So if I did need any advice, I would ask my daughter. What you put on the inside shows on the outside - eat well and drink plenty of water! Use as little water as possible on your face.. never use soap products and just cleanse. To keep the sun off your face - I look 10 years younger than my age due to this. Drink as much water as possible! Take off your make up before bed - and moisturise, moisturise, moisturise! Get plenty of beauty sleep. Give your skin a treat i.e. a facial, every once in a while! use sun cream every day. Be yourself and know what suits you - don't copy other peoples' make up unless you know it goes with your colouring. Stay hydrated even in the winter! The best tip I've ever been given is to rub some nail varnish remover over your nails and let them dry before painting - It helps remove all the oils and things that make your varnish more likely to chip! Whatever the weather, always use spf on your face. Take your makeup off every night before you go to sleep! That beauty comes from the inside out. Don't start wearing lots of makeup. Keep it simple. Get lots of sleep, drink lots of water & Cleanse, tone & moisturise! Use a good moisturiser and primer before applying make-up. Having a good base to start with really makes all the difference. Drink water as you cant make dry skin look good. Drink plenty of water, and it works! Always use primer, it makes the make up last so much longer!